The Acura® manual family was built with the user in mind. Instruments combine high-tech materials with exceptional user friendly ergonomics. Whether in research or routine applications they bring more than superior performance and make pipetting safe and agreeable. (± 0.5°C) comprised between 20 and 25°C in accordance with ISO 8655. The challenge for our engineers in combining high tech material with ergonomic design was far above average, and they succeeded excellently. Whether in research or routine applications, the result is an instrument designed and built with the users in mind.The precision pipettes offer much more than superior performance. Enjoy exceptional convenience, comfort, safety and sturdiness, enjoy your Acura® . State-of-the-art micrometric volume setting is performed smoothly and precisely by turning push button. Finely machined click-stops and free rotating cap prevent any unwanted volume alteration. Located on the front of the instrument, the display window allows set volume to be visible at all times during pipetting. A comforting reassurance for the user. Most ergonomically positioned, the large surface, soft padded ejector button provides for low-pressure activation. In addition to ease of tip ejection, the shaft height adjustment system called JustipTM (4 mm span) - controlled by efficient click-stops - allows a wide selection of tips to tightly fit the nozzle. The swift-set user calibration system - with integrated key and locking mechanism - makes tedious procedures a thing of the past. Easy and precise, it is in full compliance with international standards and recommendations. New seal sicker as safety protection of calibration switch. All Acura® manual pipettes have colour-coded display windows and Smartie button caps suggesting a selection of suitable tips. Are other colour combination desirable for individual, lab or department identification? Then choose among 14 colours of Smartie, or pick the Smartie mix which contains all colours. Shock, heat, chemicals and UV light resistance is provided by carefully selected materials and good construction. Consequently, maintenance requirements are close to inexistant. Thorough cleaning and sterilisation can be achieved by autoclaving the instrument fully assembled (121°C / 250 °F - 20 minutes). Each instrument bears its own serial number and passes strict performance control attested by an individual QC certificate. The Acura® manual 835 models accommodate a cellulose nozzle filter providing added protection of both pipette and sample. The filter prevents any aerosol contamination of the pipette and contamination carry-over to the sample. It also blocs any liquid from entering in the barrel. Allows fitting of Pasteur pipettes addition to Polypropylene tips. Adapter has two O-rings guaranteeing proper holding and tightness of standard 2 mL Pasteur pipettes (Ø 7 mm). Accessory to be ordered under Cat. No. 1.835.631 (2 mL macropipette) and Cat. No. 1.835.633 (5 mL macropipette). -Optimal tightness fitting on Socorex® pipettes and broad compatibility with other brands. 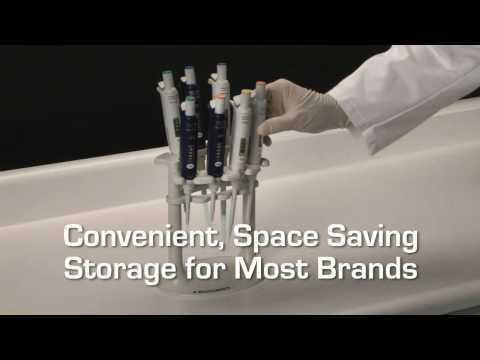 - Attractive space saver pipette stand holds up to seven single channel pipettes of most brands. - Made of sturdy polyamid material, easy to clean.